My first thought after seeing the second Daring Cook's challenge was, "Why mess with perfection?" Jen from Use Real Butter had chosen Chinese dumplings as the challenge, which coincidentally, was one of my first posts on The Cooking of Joy. I've been making my mom's recipe for dumplings for as long as I can remember not only because it's my mom's but quite simple because it is the best-tasting dumpling I've ever had. In my opinion, it has the perfect ratio (1:1) of meat to vegetable and is just seasoned enough that you can serve it boiled with only some sriracha sauce for heat, if you want. So seriously, why mess with perfection? 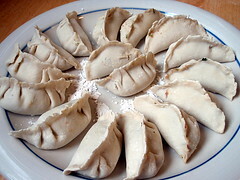 But Jen's request to "try something different" if we'd made Chinese dumplings before echoed in my head as a challenge. Then when I came up with the idea to make kalbi using the kiwi, pear, and apple I had gotten in my Boston Organics delivery, I started thinking about making a beef dumpling filling with the same marinade. And using Romaine lettuce instead of napa cabbage as the vegetable since Romaine is traditionally eaten with kalbi and bulgogi (Korean marinated barbecued sirloin beef). And ssamjang (seasoned soybean paste) as the condiment. And thus, the bulgogi dumpling was born. One of the other requirements for the Daring Cook's challenge was to make your own wrappers. Jen had posted a recipe that used warmed water instead of the boiling water recipe I was used to. Since I was doing something different anyways, I figured I'd try her recipe (using her mom's version to mix the dough) but I soon realized that I much preferred the boiling water version. The warm water version gave a really stiff dough that was much harder to work with. At first I thought that maybe I hadn't added enough water, but the recipe only called for 1/2 cup water for 2 cups of flour, and I had already added about 2/3 cup of water. So I ended up scrapping half of the warm water dough and making a half batch of the boiling water dough, which I've reprinted here. 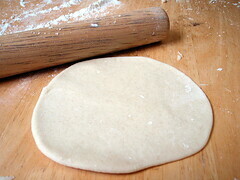 Using the boiling water and kneading the dough for a good five minutes allows the dough to develop a lot of gluten. Resting it for 20 minutes makes it even more pliable so that you should have no problems rolling out your wrappers and stretching them while wrapping. Above is a side by side visual comparison of the two wrappers with the boiling water ones on the right. The reason for the color discrepancy is simply because I ran out of bleached all-purpose flour after making the warm water wrappers and used unbleached all-purpose flour for the boiling water ones. Soak the bean thread vermicelli in a bowl filled with hot water for 15 minutes. While the vermicelli is soaking, use a food processor to mince the lettuce and scallions. Transfer to a large mixing bowl. Squeeze out the excess water in the vermicelli and use the food processor to chop into about 1/2" pieces. Add to the mixing bowl. Add the ground beef, marinade, and sesame oil and mix well. Cover and refrigerate until ready to use. 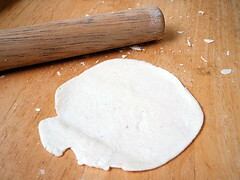 Once you have your dumpling wrappers ready, prepare plates or trays with flour for dipping. Put a spoonful of the filling in the middle of a wrapper and fold in half. Seal center portion of the joined edges. 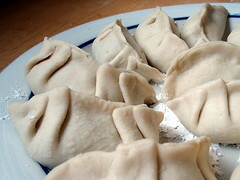 Make two pleats on both the left and right side of the dumpling. Make sure that the whole thing is totally sealed and then dip the bottom in the flour and place on the tray. Here are step-by-step photos to show you how it's done, or you can check out this video, but ignore the part about wetting the edges. Since we are using fresh dumpling wrappers here, you can skip that step. 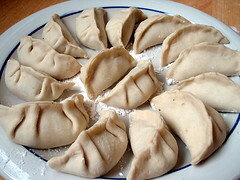 To pan-fry the dumplings, heat a frying pan on high and add oil once it is hot. 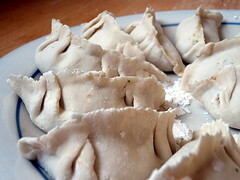 Once the oil is hot, add the dumplings one at a time so that they are sitting upright. Once the bottoms are browned, add about a 1/2 cup of water (for 8 dumplings, my usual serving size). If you like your dumplings extra crispy, add 1 tablespoon of flour or cornstarch to the water and mix to get rid of the lumps before you add it to the pan. Be very careful as the steam coming off the pan may burn you. Cover and let cook for a few minutes until the water is almost all gone. Remove the lid and let the rest of the water cook off. Pour boiling water into the flour, quickly stir with a fork or chopstick, mix well, then add the cold water. Mix and knead into a soft dough about 5 minutes. Cover with damp cloth or paper towel. Set aside and rest for 20 minutes. Knead the dough for 1 minute and divide into 4 quarters. Roll one quarter into a long snake and pinch into about 1 inch lengths. Dust flour on work surface. Roll each piece into a circle of about a 3 inch diameter. Try to make the edges thinner than the middle. Instead of the usual soy sauce, vinegar, sesame oil, and sugar dipping sauce I like to have with my dumplings, I just served it with ssamjang. 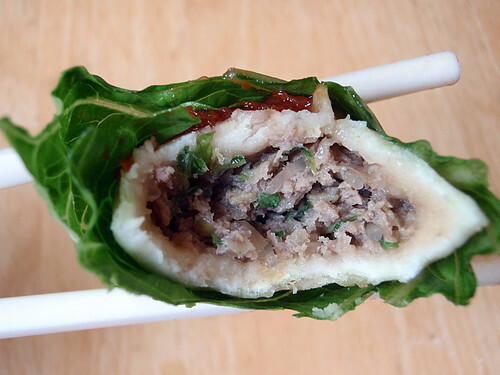 The intense saltiness of the season soybean sauce complemented the sweetness of the marinade, but I have to admit both flavors were a little too strong, so I tried wrapping some Romaine lettuce around a dumpling, similar to how I like to eat my kalbi. This combination ended up being perfect as now there was a balance of all the oral senses: taste (sweet and salty), temperature (hot and cold), and texture (crunchy and soft). So once again, the Daring Cooks Challenge forced me to try something I normally wouldn't have made, which is the point of a challenge, I suppose. To be honest, I'll probably continue to stick with my mom's dumpling recipe and store bought wrappers, but it was pretty fun to make these, and I'm looking forward to next month's challenge! i'm curious about the kalbi sauce you buy premade. i didn't really know there was such a thing. and then wow, you make your own dumpling wrappers. they look outrageously good. I'm definitely going to try your boiling water dough next time -- I, too, found the dough to be stiff. They still turned out well, but I'm intrigued to try a dough that rolls out smoother. 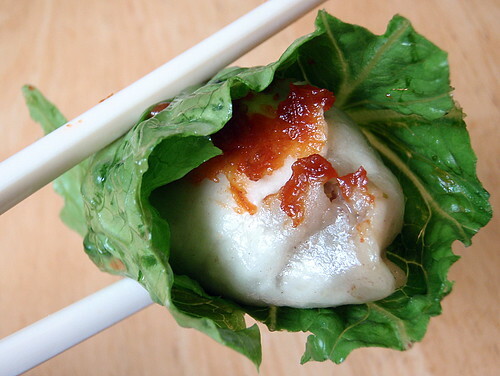 Not only are your dumplings beautifully pleated and cooked, but I love the originality with the soybean sauce and lettuce wrap. What a great idea! So maybe now you have something to teach your mother! Those look incredible. Your pleating is perfect. These look great, clearly you have add experience making them because mine are nowhere near as perfect. I guess practice makes perfect! Thanks for the boiling water tip, I will definitely use that next time. Justin - I've never bought the kalbi marinade before, but my roommate has, and the results were very delicious. She got it at a Korean grocery store. frenchietbd - It's definitely due to practice; I've been making dumplings since I was a pre-teen! I like the idea of eating it with the lettuce. Yum yum!! 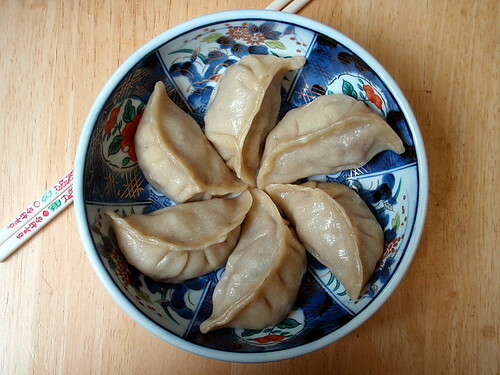 Your dumplings look amazing!! Your photos are beautiful as well =D. 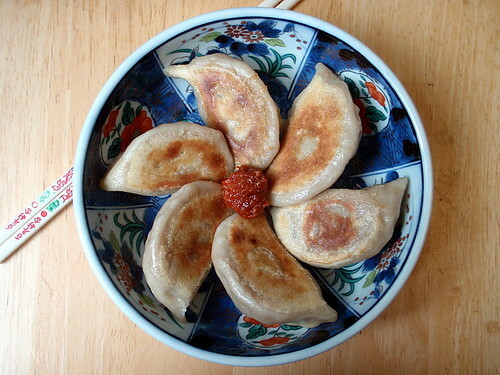 I was thinking of making kimchi dumplings, but your bulgogi dumplings look so amazing that I'm tempted to try my hand at these instead! Wow, how gorgeous are those?! The bulgogi sounds like a fantastic filling. I think as far as the dough goes, if you measure the flour by weight instead of volume, it should work out (and also - since everyone's climate varies, you can add water as needed to achieve the right texture of dough). Great job!